You know, sometimes the simplest designs are the best. 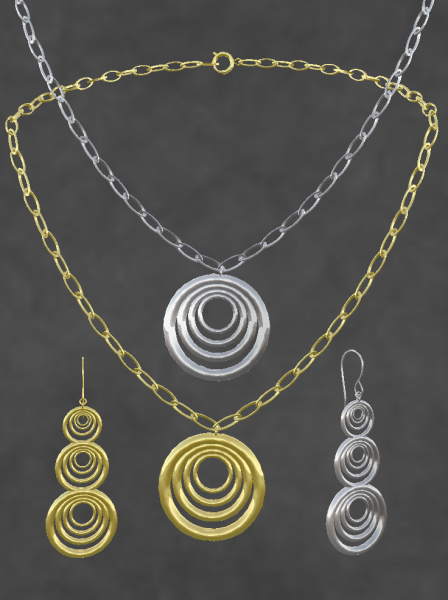 The Rings of Gold Necklace & Earrings was one of the first jewelry sets I made in SL. I've worn it myself many, many times--because it just goes with every outfit, even the ones with that odd color you just can't seem to match. So, rather than bump this classic design for a more recent item, I decided to re-vitalize it with a higher quality texture...AND to produce it in silver. 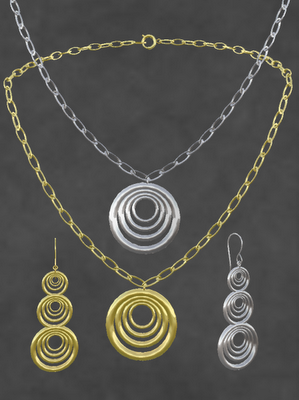 Now, you can have both gold & silver in one reasonably priced set--ONLY L$100 Introductory price for the first week, then ONLY L$150! Skin: Sarah, Gloss Beauty, a free skin from Mamboo Chic--BEAUTIFUL skins at reasonable prices. Hair: ETD Bonita--another great freebie! And I'm enjoying a shopping outing at one of the lovely Costa Rica sims. Was That Celtic Amazons Or Creative Angels?